Memes and Copyright Infringement – Do Internet Laughs Infringe? Memes have become ubiquitous in social media, flooding news feeds and time lines with jokes and pop culture references. The source material for many of these memes include the intellectual property of movie studios, artists, and photographers. How, then, do these memes not infringe on the rights of the intellectual property owners? The answer is not always clear. Per the Merriam-Webster dictionary, a meme is defined as both “an idea, behavior, style, or usage that spreads from person to person within a culture” and “an amusing or interesting item (such as a captioned picture or video) or genre of items that is spread widely online especially through social media.” Memes are essentially any image or snippet of pop culture that becomes associated with a certain idea. For example, a popular meme is Kermit the Frog sipping a glass of Lipton tea (as pictured below). The meme has especially taken hold with sports fans. For example, following the 2015-2016 NBA Season when the Golden State Warriors, despite setting single season records for wins, fell to the Cleveland Cavaliers in the NBA Finals. Memes flooded social media featuring the image above, with captions similar to “How are the Warriors the greatest team of all time when they lost in the finals? But that’s none of my business.” The Kermit meme is but one of hundreds of memes that have found their way online. The image above comes was taken from a Lipton Tea ad that aired in 2014. How, then, are internet users allowed to use the images above with impunity without infringing on the rights of Lipton Tea or the Muppets? The answer lies in the Fair Use doctrine of the Copyright Act. Courts typically use a four pronged test outlined in the Copyright Act to measure Fair Use. This test includes the purpose and nature of the use, the effect of the use upon the value of the copyrighted work, the nature of the copyrighted work, and the size of the portion of the copyrighted work used in relation to the copyrighted work as a whole. Generally speaking, the use of a copyrighted image for the purposes of commentary, criticism, reporting or teaching are considered fair use by courts. Additionally, the use of these images in memes may fall under the realm of parody or satire, both of which are protected under the law. 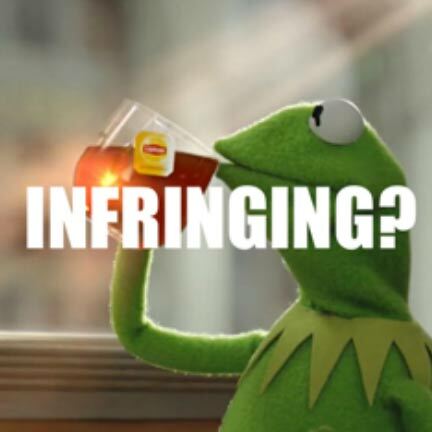 For now, memes are apparently viewed by the law as harmless to intellectual property owners, which begs the question whether the person who meme-izes existing content has any rights in the modifications to that content – certainly a question of degree.